*Note: In January, 2005 this section of our site was expanded and rearranged. If an image is not in an expected place, please try one of the other pages from the list at the bottom of the page. 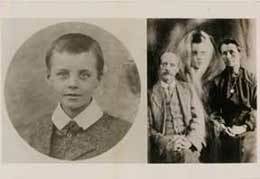 Cyril Permutt's book Photographing the Spirit World suggests that the three cards in the first row are by Mrs. Ada Emma Deane, taken in England from just after World War I through the1930s. 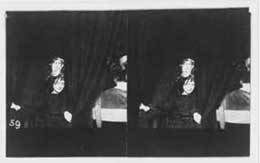 We have found references to Mrs. Deane in several of the books on spirit photography in our collection. She convinced Arthur Conan Doyle that she was genuine because he was not able to accept that such a "simple" person could manage such a ruse. 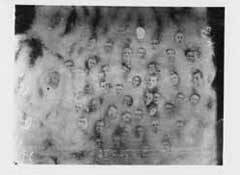 The cloud with spirit faces, on the far right below, is identified as a "thoughtagraph" and purports to be imposed by the mind of the medium, Ada Deane, on photographic film. The practice of "thoughtagraph" continues to today. 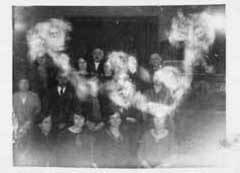 Our spirit photography links page includes several sites on this "science" by contemporary practitioners such as Ted Serios and Rudi Geller. The first postcard in the row below is exciting to us since it is a stereo postcard attributed to Eva C. (Martha Béraud) a French medium. 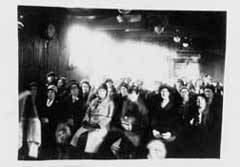 In the 1920s she was photographed with what was described as "ectoplasm" that took forms like the face above her head seen in the close up in the center of the row below. When viewed with a stereo postcard viewer there is an appearance of depth in the scene. It would seem a bit harder to fake than a single image but it seems likely that she discovered a way to do it. It also seems ironic that a "spirit" face would so closely resemble a style you would expect in popular 19th century prints. The postcard with a young boys picture beside a couple with a spirit was made in 1923 by the Society for the Study of Supernatural Pictures. It purports to show parents with a spirit of their dead child and a photograph of the child in life. *Note: In October, 2007 this section of our site was expanded and rearranged. If an image is not in an expected place, please try one of the other pages from the list below. Mesmerism - "Flint the Mesmerist"